Happy campers can now book a pitch at the new £3.7m caravan site within the popular Rother Valley Country Park (RVCP) in Rotherham. Plans were approved last year detailing how six hectares within the Greenbelt site would be used to create an attractive caravan site which complements the country park and combines with the leisure facilities. 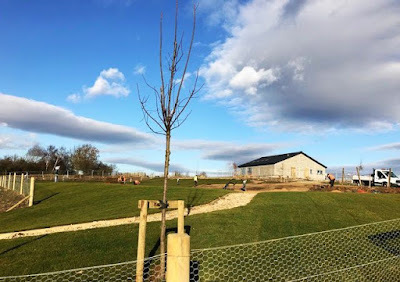 The site will offer 129 pitches for touring caravans and motorhomes, plus space for 34 tents, along with modern toilet and shower facilities, a reception block with café bar, a shop for visitors and a children's play area. With work well underway by contractors, Geo Houlton & Sons Ltd, an opening date has been set for April 12. The site has been named Waleswood Caravan & Camping Park (there is already a Rother Valley Camping Caravan Park down South). Pitch prices range from £24 per night, for a small tent pitch, to £39 per night for an extra large "super pitch" for a large motorhome or caravan. The operators are hoping that the site will gain "AA 5 pennant" standard for its facilities and services. The camping and caravan site is an "invest-to-save" initiative from Rotherham Council with the income generated putting £339,000 each year back into Council coffers. It is set to benefit from the opening of Gulliver's Valley in 2020 - the new £38m leisure development on adjacent land. The contractor's construction programme has a completion date of March 4 and it is hoped to initially operate on a trial basis. That's very expensive - gold plated showers?